Mountain Pointe safety Kenny Churchwell, playing the ‘eeny, meeny, miny, mo’ game Friday, initially picked up an Arizona State hat. He started to put it on as friends and family in the room started to applaud. But then his mother grabbed his arms to stop him. He put the ASU hat back down and grabbed the UCLA hat as students screamed and swarmed him. 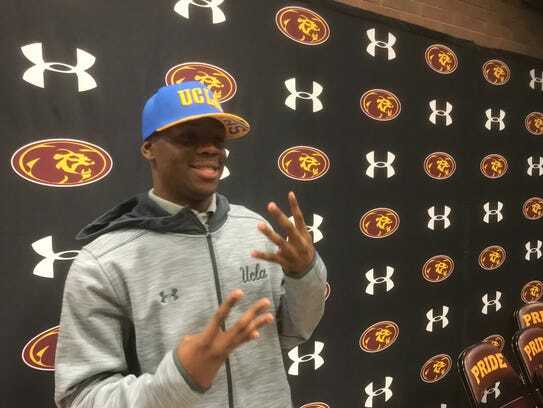 Churchwell, picking among UCLA, ASU and Arizona, announced during an early-morning news conference in the Mountain Pointe High School gym lobby that he will play college football for the Bruins. UCLA didn’t offer him until two months ago but he always thought of himself playing at a major university in California. The All-Arizona senior took his official visit there last weekend. “UCLA is a great school,” Churchwell said. “Everybody dreams of going to California. Churchwell, who teamed up in Mountain Pointe’s secondary with current USC safety Isaiah Pola-Mao during the Pride’s 2016 runs to the 6A final, will now be a football rival with his good friend in the Pac-12. But USC wasn’t among the three hats in front of him at a table on Friday. It was Arizona, ASU and UCLA. All three schools have new coaches. It looked like it was ASU when Churchwell picked up the hat. But he told the students to hold back before rushing him, then put the cap down and put on the UCLA hat, as more screams of joy erupted. He embraced his father, Kenny Jr., in an emotional hug, filled with tears. Churchwell said he was leaning towards ASU at one point. 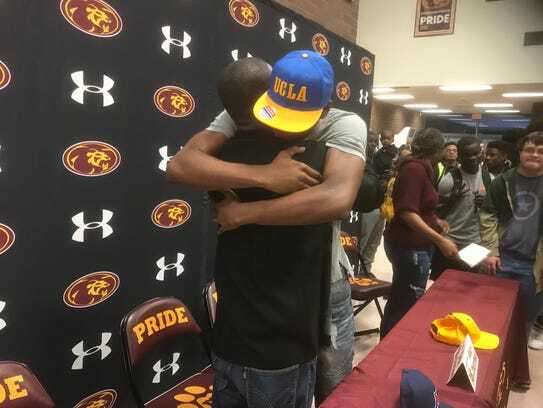 Churchwell texted former Mountain Pointe offensive lineman Kenny Lacy, who plays at UCLA, asking him if he thought he would get a UCLA offer. Even though Churchwell hadn’t yet to receive the UCLA offer, he posted on Twitter in early November that the Bruins were in his top five.